﻿ Look at the picture and guess what the man is doing. Do you know his name? What branch of biology he may be working in? Look at the picture and guess what the man is doing. Do you know his name? What branch of biology he may be working in? 7. Read the text and complete the details. 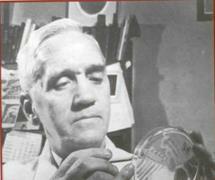 Sir Alexander Fleming (1881-1955) had a colleague who until quite recently still worked at St. Mary's Hospital, London. According to this colleague, the discovery of penicillin would never have happened if one day in 1928 a piece of mould had not floated in through an open window (possibly from the pub opposite) and landed on a glass plate Fleming was using in an experiment. The plate was covered with a nasty bacterium called staphylococcus. A less observant scientist might have dumped it straight in the bin, but Fleming noticed there were no bacteria near the green mould. In tests, he discovered that the mould also killed other bacteria, yet could be given to animals with no obvious side-effects. The discovery, which became known as penicillin, was the first antibiotic, and was able to combat a host of fatal bacterial diseases. Finally, in 1945, Fleming and two other scientists shared a Nobel Prize for the discovery that was to save millions of lives. Answer the questions about your present-day occupation. 1. Have you been doing interesting and exciting things over the last year? 2. Have you achieved everything you wanted to over the last year? 3. Do you want to be doing the same job in five years' time? 4. Is everything exactly how you want it in your job? Fill in the table placing jobs into the column(s) depending on the category you refer it to. Add two more examples to each category. a) Choose one job from every part of the table and explain why you’ve placed it there. b) What job are you more likely to deal with in your future? Give arguments. Correlate verbs and nouns in A and B groups to form set expressions (some variants are possible) and use them in the sentences of your own. 4. Make combinations using the words from the three columns (consult dictionary if needed) and the questions given below. 1. What happens when someone works very hard and has good results? 2. Who is the most important person in a company? 3. How do people work in most factories? 4. What does everyone have to pay to the government each year? 5. What payment do employees get when they are ill and stay at home? 6. What working hours do managers in large companies do? 7. When you're looking for a job who can you ask for professional help? Find out and explain the difference among the phrases. 6. What do you think should be taken into consideration in choosing a job? Arrange the criteria and mark them 1 for the most important down to 11 for the least important. Discuss your results in groups. Choose a statement or a question from the listed above as a theme for your essay. 1. Why do so many people in the modern world become workaholics? Could this be called a disease? 2. Retirement should be made compulsory for everyone at the age of 60. 3. Having a happy family and personal life is more important than a successful career. 4. How important is good education and qualifications in finding a job? Is there a relationship between the education/qualifications you have and the money you earn? 5. Should teenagers work, e.g. take up part-time or holiday jobs, in order to earn some money of their own? At what age should people start earning money? 6. What, in your opinion, motivates people most to go to work: boredom, the need to make a living or the need for respect and social recognition? Read the title and opening quotation from an article giving careers advice on finding your ideal job. What advice and information do you think the article will give on the following questions? 1. What do you want work to do for you? 3. Where can you look for your ideal job? 4. What's involved in the application process? Read the article and check your answers in exercise8. II. Prepare a speech for foreigners who are going to work for your company and have just arrived. Speak about advantages and disadvantages of living and working in your country.